Not every day do I get an actual good lead or corroboration on a new-to-me coffeehouse from personal contacts. Most often people will throw me something I've been to or have heard often, but not always do new or forgotten tips pour forth. But just this past week I was talking to a new acquaintance and he reminded me of a place I'd heard of but had escaped my radar, a place called Kaffe 1668. With my memory freshly jogged, I made my way over soon after. 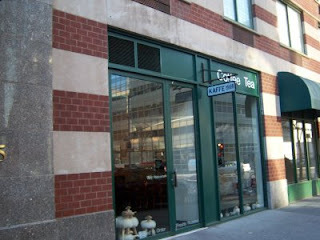 Kaffe 1668 is located a block or two north of Ground Zero on Greenwich St in a nondescript building with floor-to-ceiling windows and a simple street sign outside. The inside blew me away with an almost complete contrast, as the interior was possibly the best decorated cafe I've ever seen, with beautiful furniture (even a beautiful banquet table) and just an overall well-construed ambiance that made me want to redecorate my apartment. The coffee comes from Intelligentsia and Plowshares Coffee Roasters, as well as a guest espresso from random roasters (this time, it was from Ecco Caffe). I had the Bolivian (didn't ask who roasted it, though I'm pretty sure it was Intelligentsia) via a Clover machine. The coffee came out beautifully, displaying hints of flowering grass and an overall taste of pomegrante. I had the guest espresso, an Ethiopian single origin from Ecco, which by far was one of the best espressos I have had in a long time; the front of the shots were crowned with the flavors of vanilla ice cream, following with some orange and semi-sweet chocolate. The tea is free leaf and organic. Walking away, I thanked my lucky stars that Kaffe 1668 made it back onto my map as the experience was one I shant forget. If you are anywhere near Manhattan, give it a hearty try. I have to say, there's nothing like the allure of a new/unknown café... just yesterday I realized a new café had opened in my neighborhood (only blocks away from Kaffe 1668) called RBC NYC. I don't know if you've checked this place out yet or not, but if you haven't, it's worth a trip (71 Worth St).